Banner design studio helps to create flash and static banners using pre- designed templates. Banner maker gives you the flexibility of creating a banner from 17 preset sizes or define custom size for banner. Banner Design Studio Features: * Create banners using pre designed animated and static banner templates. 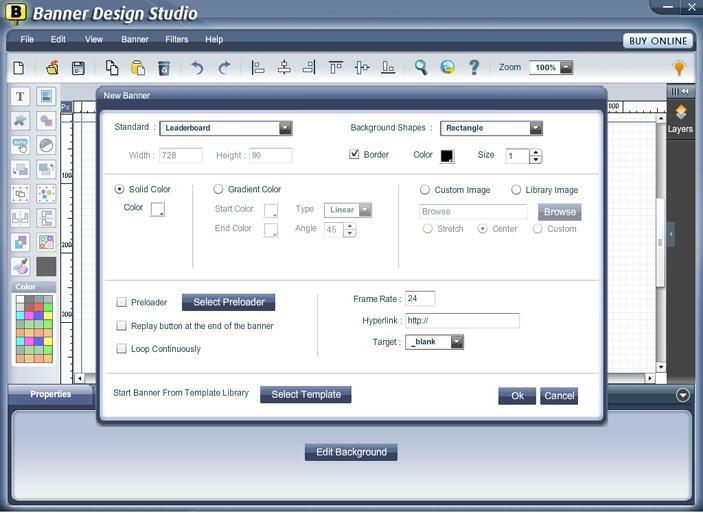 * It's template library includes nearly 500 templates. * Apply background animations and images from in-built library or import animated backgrounds in SWF format. * Add and customize text, images, dynamic shapes and symbols in banner. * This banner creator has easily applicable effects like transparency, rotate, flip, outline, shadow and blur effects and more in just a single mouse click. * Ready to use transitions and overlays. * Pre designed set of Preloaders and buttons. * Flexibility of opening multiple banners in separate tabs. * You can apply color adjustments like brightness, contrast, hue and saturation. * Arrange banner elements with tools like select-all, group and ungroup, lock and hide, send backward and bring forward and alignment. * Provide special effects -filters like grayscale, invert, sharpen, edge and water or overlays to banner. * Fill banner elements using 5 color palettes, color picker or fill with image. * Import system fonts, access font character map and even multilingual fonts. * Combine multiple banners into single file and perform loop action. * Banner Rotator can be used to rotate multiple banners in a sequence. * Use FTP Feature to upload banners. * Banner generator allows you to save and export banner in SWF, HTML, JPG, PNG, TIFF, BMP, PDF, GIF and get transparent output in GIF, PNG, HTML and SWF formats. We takes special care to ensure that credit card and billing information is not compromised . Your personal details are kept secure and not used in any way other way than as laid down in our policy policy. Banner Design Studio offers USA daytime telephone support and 24 hour email support.